This spring, thanks to help from the Bullfrog community, the Swiilawiid Sustainability Society in Haida Gwaii, B.C. 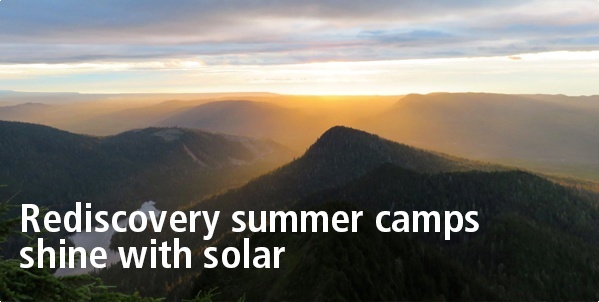 achieved its goal of installing solar panels on three rediscovery camps for youth. Young campers from across the island will arrive at the facilities this summer to find them 100% solar powered! Read more about these camps in our blog post. Specialty brewers—especially bullfrogpowered brewers—pay a close eye to locally sourced ingredients for their brews. It's only natural that they also pay attention to their environmental footprint—and how to best to reduce it. Some of their technologies and methods may surprise you! Want to know more? Read on. You may think of microgreens as simple aesthetic garnishes in Instagram food photos, but as bullfrogpowered Blush Lane Organics explains in this blog post, these little plants pack their own nutritional punch. Read on to find out why farmers markets and famous chefs alike are swooning over these sprouts. Did you know that energy efficiency measures in Canada can boost our country's GDP and help Canadian households save $114 a year on average? Read more in this report by Efficiency Canada and Clean Energy Canada, which outlines how current and future energy efficiency measures can positively impact our economy and environment. Plus: Looking for extra tips to reduce energy in your home? Download our conservation tips e-booklet!